The magnetic switch is a wonder tool for designers who would like to turn a circuit on and off based on proximity. The Shiny Clutch and Aromatherapy Sachet in our book Switch Craft are two examples. However, buying the right magnetic switch can be tricky at times. To cut a long story short: If you'd like to turn something OFF when the two halves of your switch are apart, buy the NORMALLY-OPEN (NO) type; to turn something ON when the two halves are apart, buy the NORMALLY-CLOSED (NC) type. This is the textbook definitions of NO and NC. For unknown reasons, there are some companies classifying their magnetic switches against the grain. Their NC switches turn things OFF when the two halves are apart, while NO does the opposite. This is why even some salespersons are confused as well. 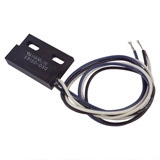 Therefore, before purchasing any magnetic switches, read the product descriptions carefully. This is one of those contrarian places that label NO and NC in reverse. So look for "low profile normally open magnetic switch" on their site. Note the $20 minimum. This was the only place where we managed to find mini NO+NC magnetic switch. 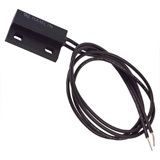 You may have noticed that many security equipment vendors also sell magnetic switches. However, some of them do not supply detailed technical specs for their merchandises. Unless you are obsolutely sure about the item, or can return it easily, think twice before buying. Since inventories change over time, the product numbers and links listed above may become obsolete sooner or later. Please leave us a comment if any links stop working. Should you find other stores selling mini magnetic switches, feel free to share it here too. Great plan it seems. To be absolutely safe, you may add a fuse. Probably not necessary in your case though. Hi this is Shawn, I was the one asking about the magnetic switch for underwater use. I went ahead and ordered the switch and I plan on trying to seal it with the heat shrink. I am going to use the type heat shrink with the sealant built in (used for splicing wire underground). I believe this will keep the switch from getting wet. The good part is that the way I am wiring it the only thing that will be in the water is the switch and the switch legs (ground), the hot wire will be at the light (safe dry location) so if water gets to the switch and causes it to short out the only thing that will happen is the light will stay on continually. I wouldn’t dare run a hot wire underwater because if it shorted out it could blow up the battery on my boat. I will also fuse this circuit just a little higher amperage than what the light draws. The light will probably draw less than an amp so I will get small 1-5 amp fuse. I will report back as to if this worked or not. @John: Sorry I'm not aware of any magnetic proximity sensor rated at 6A or higher. Try a relay? @Feb 10 comment: I personally don't know any magnetic switch rated for underwater usage. Shrink tubing sounds like a good idea if you can seal it completely. We are looking for a NO proximity magnetic switch that composes of two (preferably short) cylinders that push each other. When we force them near (mechanically) they close a 12V DC 6A circuit. I am looking for a normally closed (NC) magnetic switch to operate a light when the two halves are apart. The thing is I am trying to find one rated or made to be submerged in water sometimes. I will be using this on a 12V DC system on a boat. Do you know if the ones on this page can be used for this? If not this is what I was thinking about doing. Take some heat shrink tubing used for splicing cables underground. Shrinking it around the switch and I believe the magnet will still make the contacts through the heat shrink but if not I can get a stronger magnet. I read a comment above about using a magnetic switch for AC current and I just wanted to say that washers have been doing it for years they use NO magnetic switches for lid switches on washers. The question was asked in 09 but this was for future readers. this lighting kit, think that would be possible? I could run a solid hot wire to the power, then break the ground with the magnet in a closet, or gun safe, and when the door is opened (magnet separated) the light would come on. Is this possible just hooking the magnet to the ground as a switch? Hi. What you described is a pretty standard relay. See my comment above on 4/23/2010. Personally I'd use solid state SPST (which means two pairs of pins: one pair controls the on/off of the other) relay. Pay attention to your relay's NO/NC type too. Basically I want to tie the magnetic switch leads to the relay and have it switch AC on/off to the light bulb. Is there a relay like that (basically switches when two if it's contacts are shorted by the magnetic switch)? I'm trying to turn a light bulb on when a door is closed. I was looking for AC rated switches, but maybe a cheap DC rated with a relay is better. So...is there a relay that opens or closes just with the switch? I just want to run AC to the relay and the light bulb, but I want the relay to switch on an off just with the switch (no DC voltage). hi! Can anyone help me with the previous commet. I appreciate any help. Is there a kind of switch that has three positions depending on the polarity of the magnetic actuator? Meaning there would be two "on" states (one for a "North" magnet and one for a "South" magnet) and an "off" state when no magnet is present? Household AC power through magnetic switch? That scares me. Yes, you may find industrial-strength magnetic switches out there, but I wouldn't want to create a circuit where AC power travels around. It'd be safer to isolate the AC power to only a small part of your circuit and use DC in other parts. For example, I'd run DC through the magnetic switch and have it trigger a solid state relay that controls the AC current. That said, if you know what you're doing, don't let me stop you. Try mouser.com or digikey.com for switches that suit your needs. Be sure to read the product datasheets. Is there an NC switch which opens when AC current (110V) is fed to it? @guest on Jan 19: We are not aware of any magnetic switch that senses steel. There might be some but we simply can't think of any. However, do an online search for information regarding "inductive proximity switches." They may be what you are looking for. @anonymous guest: A magnetic switch usually comes in two halves—one wired and one not wired (see images above). The wired half is the actual switch itself, and there is no magnet in it. The magnet is in the half without wire; it is called an "actuator." Therefore, the switch's condition is changed when it comes in proximity to magnet not steel. Is a switch made with the magnet built in the switch so you only need to come in proximity to steel to change the normal condition? @brunchbabe: We always bought conductive thread online therefore can't really give you any local recommendation. However, since fencers sometimes use conductive thread to repair their lamé, you may try calling the fencing equipment sellers in NYC. I found three via Google: International Fencers Supply, Blade Fencing, and Physical Chess. Not sure if they carry it though. If you do find it in NYC, please drop us a note. We'd love to know. Love this site and thanks for making real what I thought were fantastical ideas....But where does one by conductive thread in NYC? Sure you can do that. Many security systems are wired that way. Usually, you'd want all switches to be of the same type—either NC or NO. However, if you are truly planning a super secret "hidden passageway" (your own Batcave? ), you may consider mixing NC and NO switches. Thus, only you and your butler would know the secret combination (e.g. : on-off-on) that can open the door. Can you wire these switches in a series or something so that you need to connect like 3 magnets to 3 separate switches to complete the circuit and have a switch activate, or like a hidden passageway opening? Yes, Dorion that is correct. Though there are many types of magnets with different strengths and I suggest testing the contact with your magnet to make sure you get your desired effect. For example, if your magnet is really strong it may require the two parts (magnet and switch) to be 1” away from each other before closing the circuit and having the light come on, while if its weak, it will only take a few mm. Either is fine as long as it fits your needs. Hope this helps! For those catalogs which sell magnetic switches individually as two pieces, presumably the end user can use her own magnet for the non-wired side...?